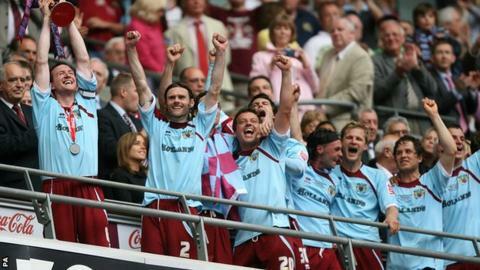 Former Burnley defender Steven Caldwell says the club's this season tops their Championship play-off victory of 2009. The 33-year-old, who now plays for MLS side Toronto FC, captained the Clarets five seasons ago as they ended a 33-year wait for top-flight football. "With such a small budget, to finish in the top two is phenomenal," he said. Joined from Cheltenham Town in 2004 and has since scored eight times in 335 appearances, and achieved promotion to the Premier League twice. "Obviously I'm very, very proud of what my team did but you'd probably have to rate this season higher than ours." Of the squad that won promotion under Owen Coyle in 2009, only centre-half Michael Duff, then Caldwell's partner in the heart of defence, remains in the squad. And manager Sean Dyche has started the 36-year-old Northern Ireland international in 39 of the club's 44 league matches this season. "Michael's a very close friend of mine and I'm delighted for him," Caldwell told BBC Radio Lancashire. "He's had a fabulous career at Burnley. To be involved in two promotions is outstanding and puts him up there with some of the club's greats."